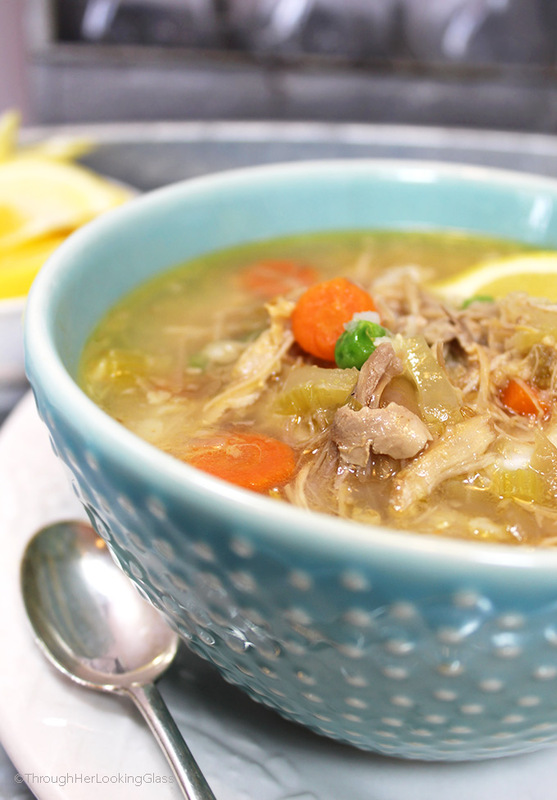 If you’ve ever tasted a hearty Homemade Turkey Soup, you know it’s chock full of fresh flavor and nutrition. The tantalizing aroma of turkey soup simmering on the stove the day after a big holiday meal is mouthwatering! Follow my simple step by step instructions (with a few surprise ingredients!) 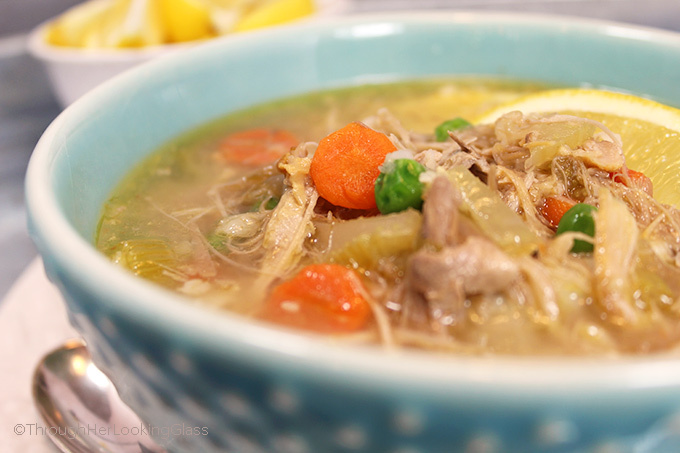 for the best turkey soup recipe on the planet. 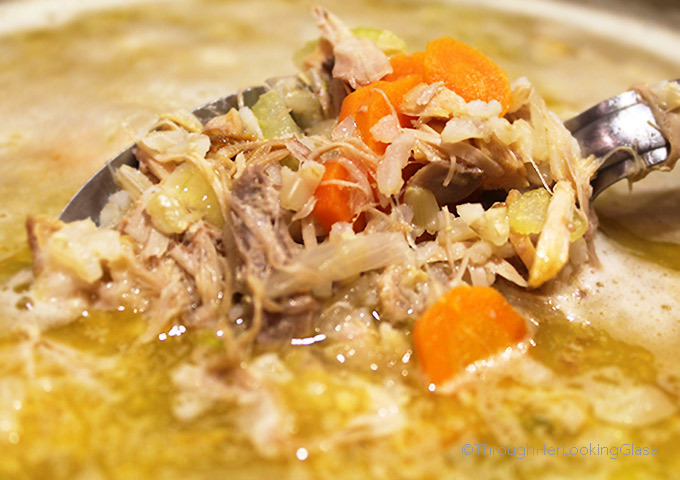 This soup boasts rich broth, tender turkey, brown rice and fresh vegetables. 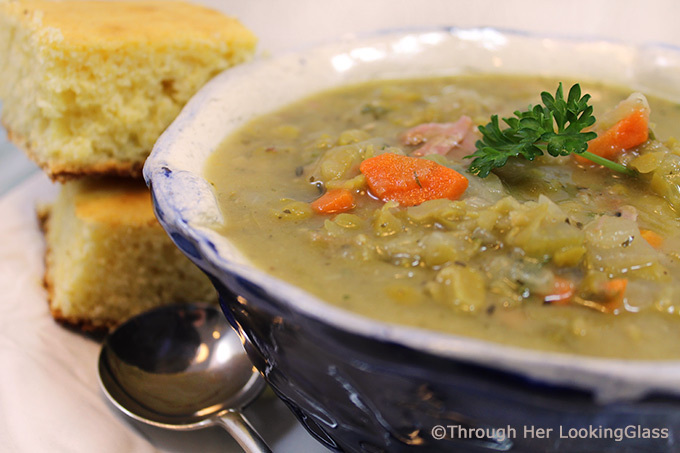 You can easily make this soup and you get to do some taste testing along the way! Making turkey soup is a multi-step process. It takes me about a day from start to finish. Most of that time the turkey bones are simmering, but there will be some hands on time at the end. Simple to do once you know the steps and oh so worth it!!! I’ve always loved the idea of stone soup…making something out of nothing. That’s why making turkey soup is so appealing to me. It feeds a big crowd for very little, from something that many would consider trash. And everyone is happy, including my wallet. So first off you’ll need to cook a turkey or have a frozen turkey carcass on hand. Sometimes I cook a turkey for a big holiday, then freeze the carcass/bones for making soup later. 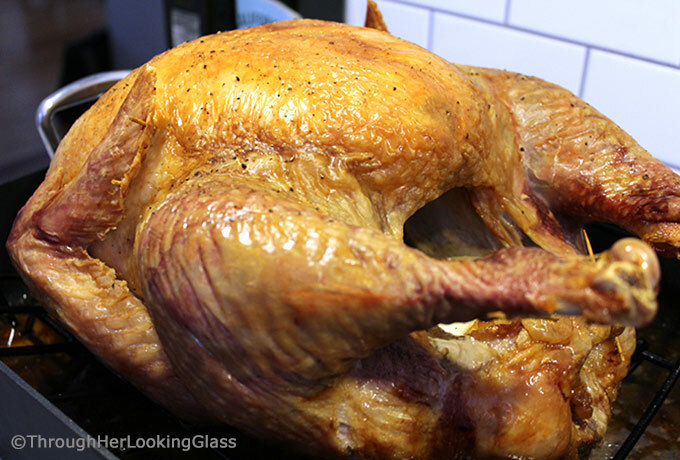 If you’ve never cooked a turkey before or need a refresher, here’s the simple version below. 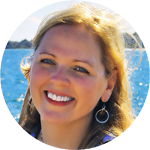 You can always google for more information or check out this post. Remove the neck and giblets from the cavity. Salt and pepper the bird thoroughly, inside and out. Leave a small amount of turkey on the bone for making the soup. The larger the turkey, the more soup it will make, so keep that in mind when purchasing your turkey. Last Thanksgiving I cooked a 33 lb. turkey and made (and froze!) over ten quarts of Homemade Turkey Soup. It’s been wonderful having the soup on hand in the freezer whenever needed. 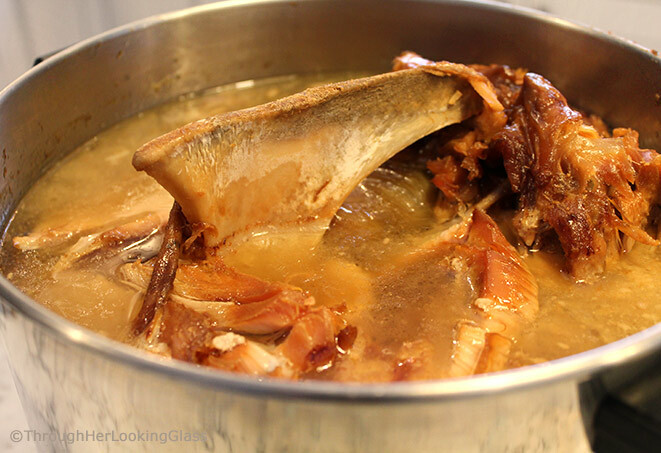 Place the turkey carcass (and wings and drumsticks if you like) in a large stock pot. (You may have to place it on its side.) That’s ok. It might stick up out of the pot. That’s ok too. As it simmers, the bones will begin collapsing and it will eventually fall down into the pot. Cover the carcass with water. Then turn the heat down to low, place the cover on the pot and simmer for 8-12 hours. I often cook it on low through the night. I start the soup simmering at night before going to bed and let it simmer, covered, all night. You may be uncomfortable with doing that, so think about the timing. You may want to start early in the morning and simmer it all day. This step takes a little time, but it makes the soup healthier and less greasy. You’ll notice once the soup is chilled that the fat rises to the top and solidifies. Skim off the top layer of fat with a large spoon and discard. This is probably the least pleasant part of the soup making process. (And note I did not provide pictures, lol.) You’ll need to remove the skin and bones from the pot. After decades of making this soup, I finally have the process down to a science. Removing the bones is a very important process, because some of the bones are very tiny and others have may have disintegrated a bit while cooking. You’ll want to be very careful to remove every single bone to minimize the possibility of choking. Warm your soup slightly at this point, just enough so you can easily get to the bones and aren’t fishing through cold, thick congealed soup. (Yuck.) Note: you may even want gloves for this process. Put a large mixing bowl on either side of your stock pot. Using a large slotted spoon or large pair of tongs, pick through the soup looking for meat and bones. You will need to separate the meat from the bones. Into one large bowl, put pieces of turkey. Into the other bowl put skin, bones, cartilage, connective tissue and anything else that looks inedible. Pick through what remains in the sieve to see if there is any good meat to add to the soup. Add the turkey meat back to the turkey soup in the stock pot. Now is the time to sautée the onions, carrots and celery in a bit of olive oil on the stove top in a frying pan over medium heat. Once vegetables are softening and onions are translucent, add them to the soup. I usually use a couple of large chopped carrots, two stalks of thinly sliced celery and a couple of medium onions diced. 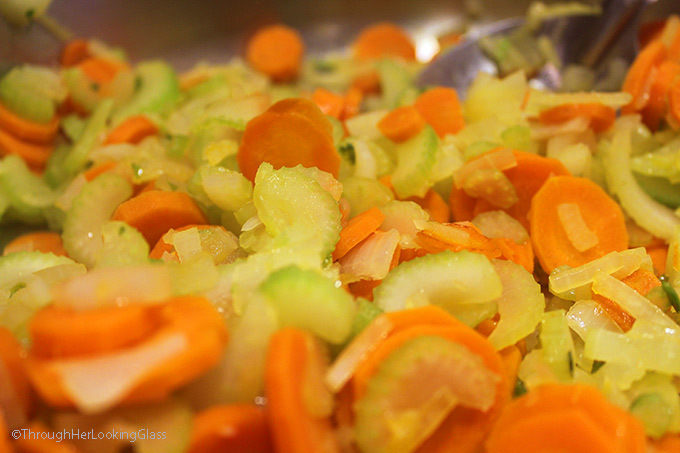 Add more vegetables for a larger soup, less for a smaller one. I keep ziploc bags of cooked rice in my freezer most of the time so I can easily add to soups when needed. If you don’t have leftover rice on hand, cook some according to the package directions and add to the soup. Be sure your rice is cooked before adding to the soup. I usually add 1-3 cups of cooked rice to my soup, depending on the size of the turkey and soup. Be aware that the rice will absorb some of the turkey broth, so don’t add too much rice or you’ll be short on broth later. You can easily use cooked noodles instead of rice. This is a delicious alternative! I suggest cooking the noodles separately, then adding some noodles to each bowl individually before ladling the soup on top. This keeps the noodles from getting mushy and also absorbing too much of the turkey broth in the soup pot. This is definitely what sets this soup apart to me. 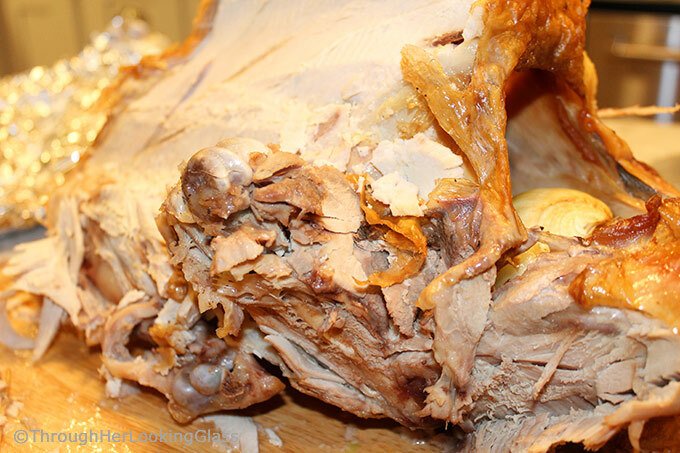 A combination of lemon juice and white wine really deepens the flavor of the turkey broth. I usually add twice as much white wine as lemon juice. The combination of lemon juice and white wine gives great flavor, and allows you to use less salt when seasoning. Try pinot grigio or any leftover white wine you may have on hand. It doesn’t need to be an expensive wine, a cheap one does the trick. Add twice as much white wine as lemon juice. Start with 1/2 cup of lemon juice and a 1 cup of white wine. Taste test and add more if needed. Fresh lemon juice is great, but bottled works fine too. I’ve used both with great results. Now it’s time to season the soup with salt, pepper and maybe even lemon pepper! Taste the soup to see if it needs seasoning. You’ll typically need less seasoning with this recipe because there will be great flavor with the lemon juice and wine. Start by adding a teaspoon of salt and a half teaspoon of pepper. Taste the soup, and add more seasoning incrementally in small amounts if needed. Just a few minutes before serving, add frozen green peas to the mix. I often add a 10 oz. frozen bag of peas to a large pot of soup and just half the bag for a smaller pot. Adding peas at the last minute keeps their bright green color, retains the nutrients and keeps them from getting mushy and overcooked. Freeze a turkey carcass for later if you can’t make the soup right away – it will keep fine in the freezer for a few months. If you make a big pot of soup and it doesn’t get eaten right way, the rice or noodles will absorb a lot of the broth. Refresh your soup with extra store bought chicken or turkey stock if needed. Add frozen sweet peas just before serving to preserve color and flavor. Season with salt and pepper according to taste, lemon pepper seasoning is a nice option. Other recipe ideas using fresh turkey: Southwest Leftover Turkey Soup, Thai Turkey Soup and Turkey Noodle Vegetable Soup. Bring to a full boil, uncovered. Reduce heat to low, cover pot, and simmer for 8-12 hours. Add more water to keep carcass covered if needed. Remove pot from heat and cool. Chill/refrigerate soup until fat rises to the top and congeals. Remove fat layer from the top of soup by skimming it off with a spoon and discarding. Warm soup slightly over low heat on the stovetop. Remove bones and skin from the soup and discard. See post above for tips to simplify this process. Be very careful to remove all the tiny bones, as they are a potential choking hazard. Once you think you've removed every bone, pour turkey broth through a woven metal strainer. Heat soup on stovetop on medium high, stirring often. Meanwhile, in a frying pan on the stovetop, sauté chopped celery, carrots and onions in a few tablespoons of olive oil over medium heat, until vegetables are just softening and onions are translucent. Add sautéed vegetables to the soup and heat thoroughly. Add lemon juice and white wine. A few minutes before serving, add frozen sweet peas. Enjoy steaming hot with a slice of crusty fresh bread! Love this soup. Definitely Taylor men-approved. I love making turkey soup! One thing I do after a holiday turkey is stripped of meat for other use is to put the carcass in a large stockpot, add water to perhaps 1/2 up the side of the pot, cover and put in the oven overnight at about 200*. The next morning let it cool until you are ready to do the dirty work. The kitchen smells heavenly!! Turkey stock is amazing. I make it all the time, because every year we buy a gigantic bird here in the village. It comes in a 100 pieces, including all the bones and organs. So I make lots and lots of turkey stock... Not to mention that I collect all the cooked bones from a roast turkey (or chicken, goose, duck - even from birds that I don't roast myself) , freeze them and use them for making stock as well. The comment above about making the stock in the oven overnight sounds interesting, I have never considered that... I should definitely try it as well.